One nice thing about the hobbies of entomology and botany is that they can be indulged almost anywhere. These two weeks I have been traveling in Brazil. We’ve had many little adventures, but our big one was a road trip to the US embassy in Brasilia to register the citizenship of my youngest grandson. The three-hour drive is pretty, but we arrived late by approximately the same amount of time it takes to clean up after a car-sick three-year-old. Then, the embassy security personnel considered it excessive that the registration of one infant should require the admission of seven people, even if each of the siblings, parents, and grandparents carried US passports. My son—very good in a crisis—managed to negotiate for six, but the guards insisted that a line had to be drawn, and I found myself left outside as the rest of my family went in. Thus it was that I enjoyed about 90 minutes exploring the landscaped area in front of the US and French embassies and a patch of weeds that surrounded a construction site. The city of Brasilia is younger than I am. It was not laid out until 1956, by which time I was in 1st grade. The idea was to encourage the development of Brazil’s interior by placing a new capital smack in the middle of undeveloped territory. 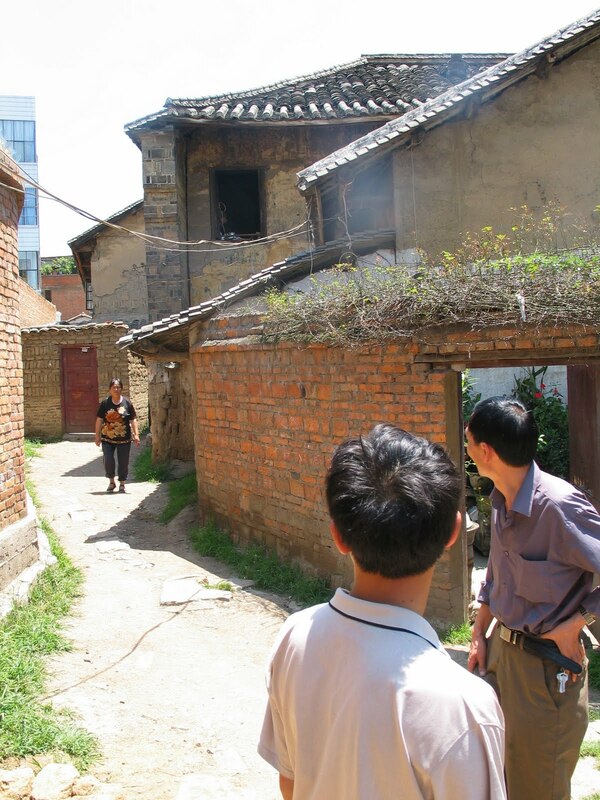 Today, the metropolitan area boasts over three million people, but its recent agrarian past was evident in the Brachiaria that dominated all of the non-landscaped areas. 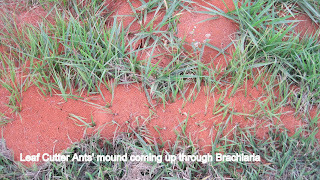 This part of Brazil was largely settled by immigrants from Germany and Italy, but the Brachiaria came from Africa. Brought in as high-protein forage for cattle, it has pushed out the native flora. 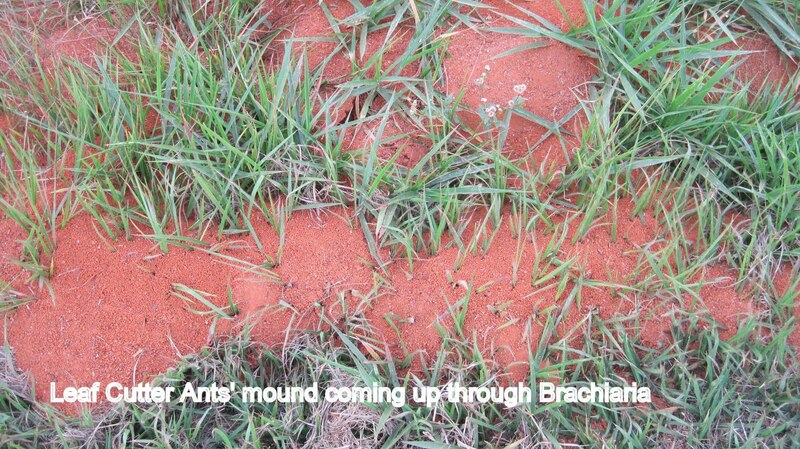 As is often the case, the field of Brachiaria had also become home to several hills of leaf-cutter ants, probably Atta cephalotes. 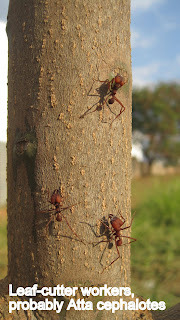 I found a column of these ants moving up and down a young mango tree, but they weren’t moving any cargo. 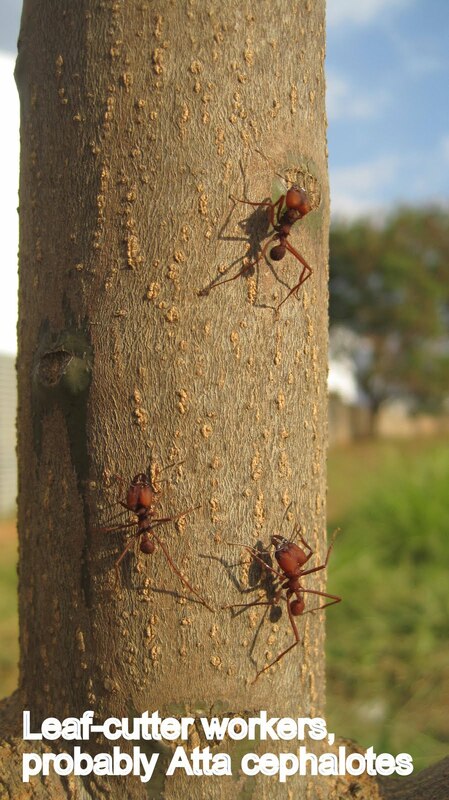 I have seen them, overnight, strip the leaves from a bigger tree than this one, but perhaps these workers, like me, were simply out for a late-afternoon stroll while the rest of the family did something inside the embassy. Several kinds of butterflies flitted about the Brachiaria. The sun was too low and the individuals too skittish for me to get many pictures, but one black and white skipper sat still while I manipulated my lens within about five inches. 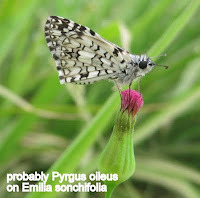 After several days of research I am convinced it is the Tropical Checkered Skipper, Pyrgus oileus (sometimes seen as P. orcus), on a Lilac Tasselflower, Emilia sonchifolia. 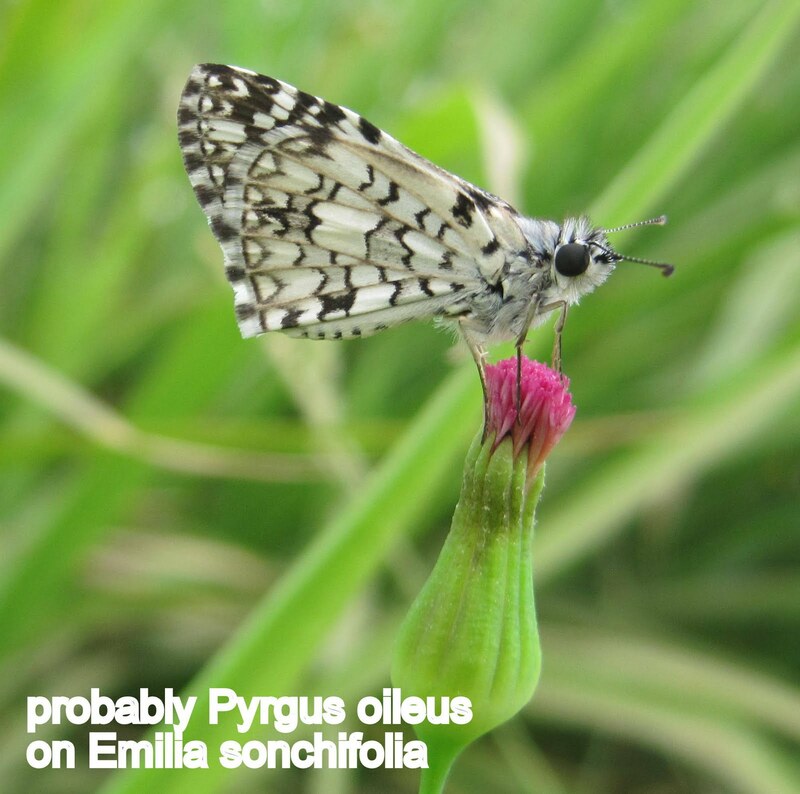 The P. oileus caterpillar feeds on Malvaceae (like cotton or mallow), but the adult likes the nectar of Compositae, like this Emilia (an immigrant from either Africa or South East Asia). 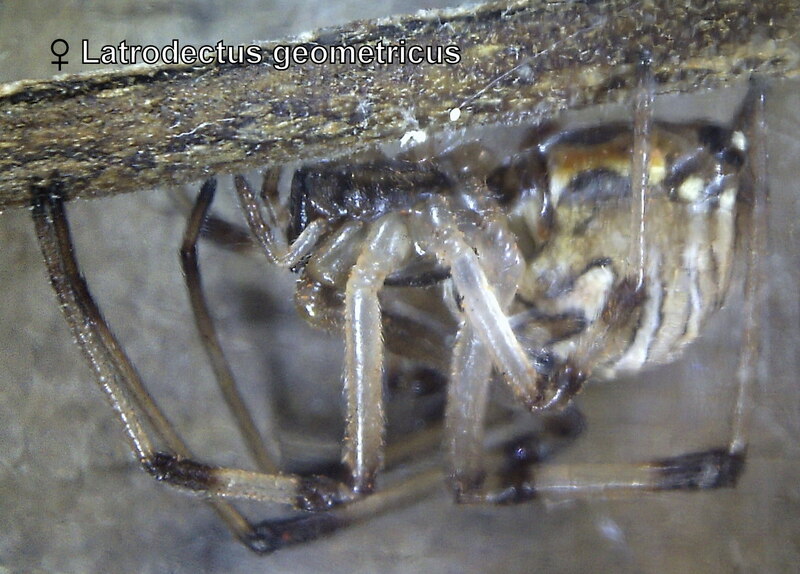 Next I investigated a long wall heavily colonized by the Brown Widow Spider, Latrodectus geometricus. Each of the females rested under a little awning; so that I wasn’t sure what I had I dislodged one. The one male I saw rested out front in a web more condensed and full of trash than the Black Widows we have in California. 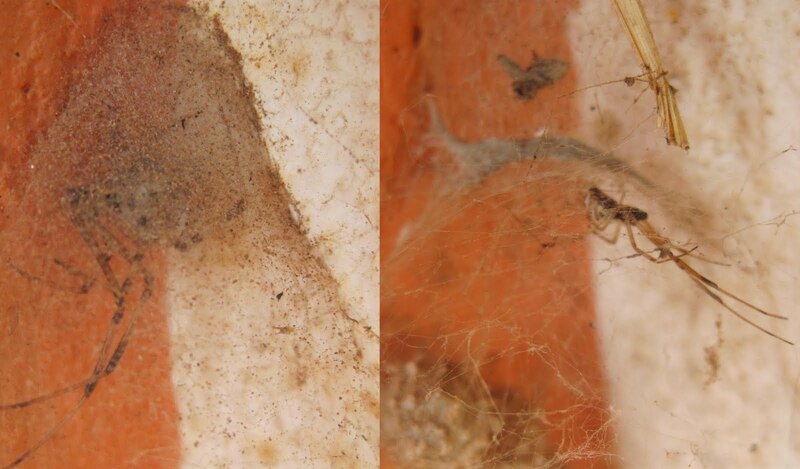 The egg sac is also distinct, covered with little bumps. I captured one female to use later for studio portraits. The landscaped areas in front of the embassy have several short palm trees. 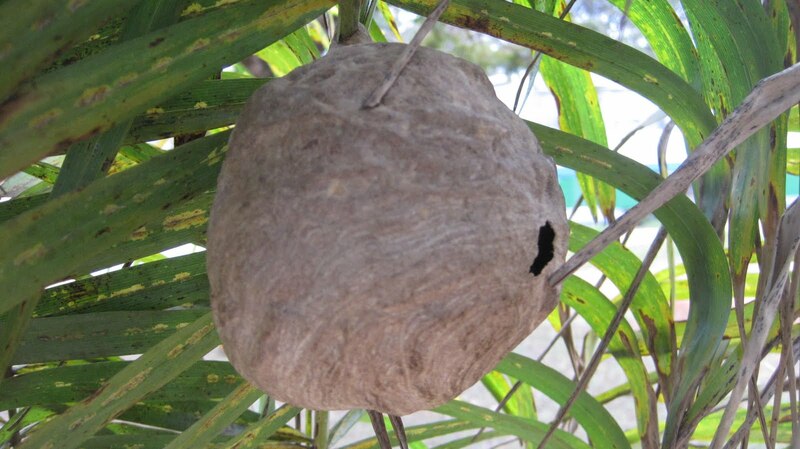 I gave each some careful inspection, in hopes of finding a jumping spider, but instead I found this wasp nest. It was now late enough that the wasps—possibly yellowjackets—were inside for the night. I was happy to leave them there. I photographed the nest from several angles, which prompted a visit from the embassy security guard, who reminded me politely that I was not to point my camera at the embassy itself. I moved on to a tree that offered peeling bark and found my jumping spider. It was probably an immature Menemerus bivittatus, the Gray Wall Jumper, a pantropical species I have seen in several countries. Later, on a dead tree, I pulled back some bark and had an adult disappear into the grass before I could get a good look at her, but from a small nest I began to see hatchlings escaping. 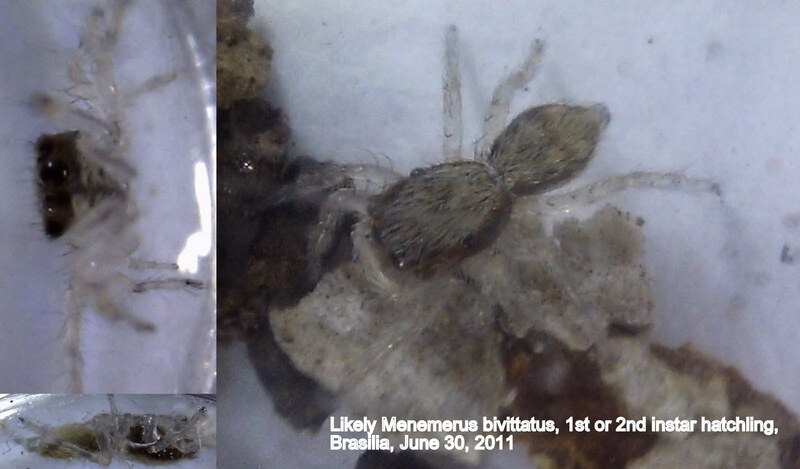 I suspect these were also M. bivittatus, and added a couple to my collection for later filming. 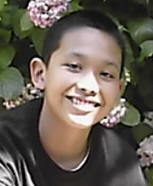 About this time my family reappeared, my grandson registered in time to celebrate his first 4th of July. However, before we left Brasilia, we took a drive through the downtown, including a pass around three sides of the congressional building (Palacio do Congress) and one corner of the presidential office (Palacio do Planalto), the supreme court, and the national cathedral. That’s the nice thing about having travel as a hobby, it can be indulged almost anywhere.